File includes liner notes, recording timing notes, and notes for corrections to the score, all for the recording of Heitor Villa-Lobos' first piano concerto. The liner notes were written by Ralph Gustafson, a friend of Villa-Lobos and Ellen Ballon, to whom the concerto is dedicated and who performed the concerto for its recording in 1948. The concerto was written in Rio de Janeiro in 1945. 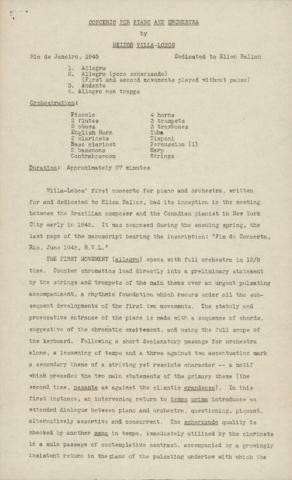 The file includes directions for transcribing Villa-Lobos' piano concerto from the records of its American premiere in Dallas, Texas with the Dallas Symphony Orchestra, conducted by Antal Dorati. Notes relating to the transcription of Villa-Lobos' piano concerto from records made at Dallas, Texas, were originally stored inside the back cover of the bound autograph manuscript of the concerto. See MS-5-2, Box 6, Folder 1.